"Falls the shadow... between conception and creation." T.S. Eliot, in "The Hollow Men"
I came across the terms "Gulf of Execution" and "Gulf of Evaluation" the other day. These were originally discussed in the context of human-computer interaction and user interface design by Donald Norman in 1986. Broadly, the gulf of execution is the gap between a user's goal and the means to execute that goal (from wikipedia). 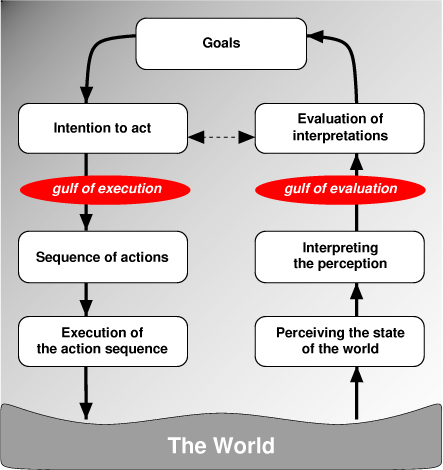 The gulf of evaluation is the psychological gap that that must be crossed to interpret the response of the system/world to one's actions (from wikipedia). I've been mulling over pursuing ideas lately. Particularly resonating were James Altucher's ideas on ideas. Specifically, what is the EXACT next step in the idea? What he is really talking about is the gulf of execution between your goal to implement something and the specific actions you need to take. They might not be the right actions - you can only tell by doing something and then interpreting the response of the world to those actions. And this of course means that you must be willing to "fail", and then evaluate the world's response. The gulf of evaluation doesn't seem as important here, because it is the "stuckness" associated with the gulf of execution that I think paralyzes more than the gulf of evaluation. And out of the womb I think that we are creatures of action. We have to be. We act, get feedback from the world, and correct if necessary. Kind of obvious, but an interesting lens through which to simmer on these concepts.